With the help of Gotye, you can't help but feel like Kimbra's follow up to her magnificent debut squanders her undeniable talent. There is a catch 22 that happens when your main claim to fame in the music industry is as a guest vocalist in a duet. Yes, you get quite a lot of exposure and mainstream music listeners directed to your solo music had you not been that featured artist. On the other hand, the success you possess is usually predicated on the talents of someone else. It’s pretty safe to say that Kimbra stole the show on the magnificent “Somebody That I Used to Know” and had her presence not been on that track, it would have crumbled as a typical whiny love song of heartbreak and longing. However, that brilliance and clever dynamic structure sung in duet form, was the brainchild of Gotye. It was he who ultimately propelled Kimbra into a spotlight. From there, it was anyone’s guess as to what she would do with it. The first thing she did was re-release her pretty awesome debut album Vows in a newly restructured format. And where that album showcased a budding young talent chalk full of some interesting and intriguing ideas, her follow-up The Golden Echo, while an admirable effort, is far too bloated and overproduced to truly warm up to. The album, plagued with meandering melodic moments that feel forced into position, begins with the fairly boring “Teen Heat”, which is reminiscent of everything but the budding narcissism and angst you would associate with being a teen. It’s immediately swept up by the more appropriate but equally bizarre “90s Music”, the first single off the album. While intriguing for the song's unusualness (there really isn’t anything else going on in popular music like it), “90s Music” is bogged down by needless name dropping of '90s inaccuracies and weird pairings. Who would ever think to include Nirvana and Aaliyah next to each other, and calling out Left Eye and TLC is redundant as Left Eye is the "L" in TLC. It’s a perplexing track that parallels a trivial “missing you” love song next to the sheer mentioning of '90s music. More perplexing is that it sounds nothing like anything that came out of the '90s. It’s a gimmicky track meant to pull in listeners through the mentioning of better artists and the praise of one of the most nostalgic eras in music. Following these two bizarre, yet oddly absorbing tracks, is the album's golden moment and best song,“Carolina”, with its catchy cooings and overemphasis on its rhymes: "On a ride TA / Caroli-NA / Drive for miles TA / See the lights-A." It is that groove along moment you were waiting for, it just took three songs to get there. The rest of the album tends to meander along with little purpose or catchy tunes to hook you in. Kimbra prefers to "OOOO" and "AH-OUUH" her way through songs in an attempt to add value to tracks that underneath it all are really just filler until you get to that next track you can groove with. There are a few tracks where this happens, however many of them are mired in older throwback styles ("Miracle", "Madhouse", "Rescue Him") that make you long to hear proper '70s disco and '90s R&B rather than these well-intended but ultimately unsatisfying interpretations. When "Love in High Places" finally plays, the only track that lives up to the promise of "Carolina", you've forgotten why you're really listening. 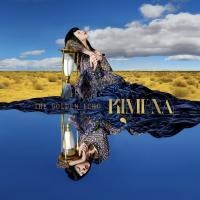 And therein lies the main problem with Kimbra's The Golden Echo. As well intentioned as it is, with occasional mesmerizing production that flutters back and forth, everything leaves you feeling like there should have been more at the root of this project. Kimbra's thrust into the limelight was for good reason, as she's quite an inventive and stylized talent who can command your presence, so she need not hide behind all the fluff and the flutter to captivate you. She can do that with a simple and haunting melody.